Are you looking for a way to introduce your kids to physics, more specifically Newton and his third law? For those of you whose physics is a bit rusty, Newton’s third law states that “every action has an equal and opposite reaction.”, and this experiment demonstrates it beautifully. Keep in mind that the escaping air is the action and the movement of the car in the opposite direction is the reaction. Step 1: Help your child cut out one side of the milk carton, as well as a small hole in the bottom, center, of the carton. The hole should be just big enough to fit the mouth of the balloon. Step 3: Turn your cart on its back. Cut the jumbo drinking straws to the width of the cart. Tape one straw near the back of the carton and the second straw near the front of the carton, to form the cart’s wheel axles. Step 4: Fit the BBQ skewers through the jumbo drinking straws. Stick the Styrofoam balls onto the ends of the skewers to form your wheels. Step 5: Turn your cart onto its wheels. Put a balloon inside the cart and push the mouth of the balloon out the hole in the bottom of the carton. Step 6: Blow up the balloon and twist the end to keep the air in. 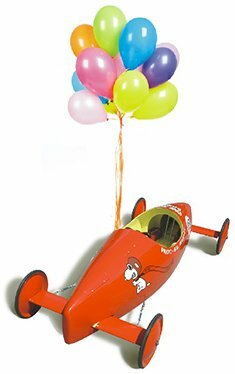 Place your derby cart on the ground and release the balloon.